There's no shortage of opinion when it comes to Riley Cooper, the Eagles' soon-to-be free agent wide receiver best known for his racial outburst at a Kenny Chesney concert last year. That off-the-field incident was itself sufficient reason for many fans to want to see Cooper gone. I'm not going to wade into that moral morass, but rather address the sizable room for debate about his on the field performance. Cooper had what was obviously a breakout season in 2013. After posting a total of just 46 receptions for 679 yards and 5 TDs in his first three years, he took over the starting lineup for an injured Jeremy Maclin and finished the regular season with 47 receptions, 835 yards, and 8 TDs. Plus, he scored another productive 6/68/1 line in the Eagles' wild card game. Cooper also put positive tape out there. He's the type of big-bodied blocking wide receiver that Chip Kelly values to augment his running game down the field. And there's a good reason Cooper's stats went way up once Nick Foles took over. He became especially effective on deep throws and in the red zone, where he was adept at adjusting to Foles' occasional errant jump balls. Kelly talks about his offense in terms of simple math. He wants to run the football and he wants to have a numbers advantage up front when he does so. That means more blockers than defenders in the box, not the other way around -- and there are two ways to achieve this. The first is to have a dangerous read-option constraint play built into the basic runs. By reading a defender instead of blocking him, the quarterback can freeze that unblocked man and enable better numbers on the play side. The second is to have dangerous wide receiver threats on the outside (ideally spread way outside) that force the defense to respect the passing game down the field. Defensive coordinators can't stack the box and provide help to both corners on the outside at the same time. As you can see in the above photo, the Saints do not respect Cooper as a passing threat. 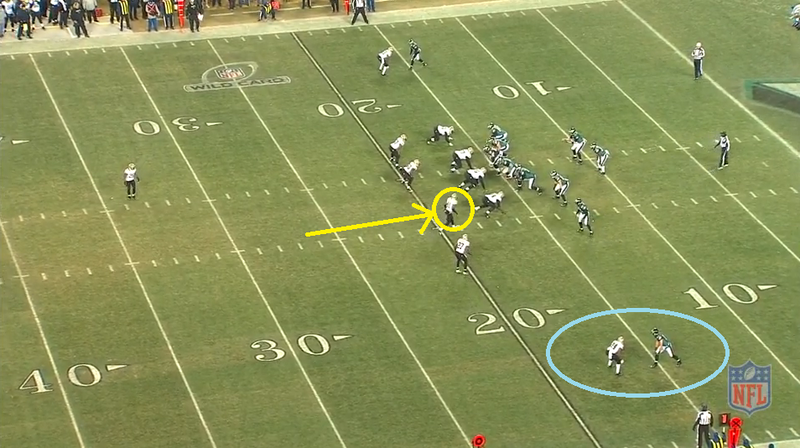 While both Eagles receivers face man coverage, DeSean Jackson's corner has safety help over the top. The Saints, rightfully, fear Jackson's speed. They don't have that same concern about Cooper, who they're perfectly willing to leave matched up in single coverage at the bottom of the image. The safety whose job could be to protect against the deep ball to that side has entered the box instead. The Saints would much rather add an extra defender down by the line of scrimmage to combat LeSean McCoy and the rushing attack. Thus, on this play the Saints have a numbers advantage up front: seven defenders in the box against six Eagles blockers. If Michael Vick were in the backfield, that wouldn't be so bad. The zone read can be a powerful weapon if defenders respect it. Foles is never going to inspire that respect. Yes, he can still make it work on occasion, pulling out a few surprise yards here or there, and freezing a confused defender now and then. But the read constraint will not work consistently without a run threat at QB, and therefore the run game will not work consistently against a numbers disadvantage up front. If Foles is the Eagles' quarterback going forward -- and he has certainly earned that right -- then the offense needs other constraints. The obvious secondary options are wide receivers that the defense needs to respect. ** Jackson is half of that puzzle. Cooper is not. The Saints treated him on this play as most defenses did this season, reveling in the opportunity to gain an advantage in the box and daring Cooper to beat them. Cooper certainly had a breakout season, with career highs in all categories. But if he were a wide receiver worth spending starter-level money on, he would have consistently beat the single-coverage insult he face on a weekly basis and forced defenses to start respecting him. He did no such thing, and the numbers show it. Pro Football Focus tracks a stat called yards per route run, focusing on receiver production on all snaps they ran a passing route. Some of the consensus best receivers in the game score highly on this list: the top ten is Julio Jones, Calvin Johnson, Josh Gordon, Justin Blackmon, Anquan Boldin, DeSean Jackson, Antonio Brown, Alshon Jeffrey, Andre Johnson, and AJ Green. These are players who combine two important attributes of a top receiver: production when targeted, and a high number of targets. As I just mentioned, Jackson placed sixth on this list. That was thanks, first of all, to the second-highest yards per target of any receiver in the league: 11.2, only behind deep threat Kenny Stills and a step above all-around beasts Gordon and Jordy Nelson. You may be surprised to know that Riley Cooper also placed in the top ten on yards per target, netting 10.3 yards per pass thrown his way. But the difference between Jackson and Cooper comes in the number of times they're targeted. Jackson, despite a spread-the-wealth offense and defenses putting heavy emphasis on stopping him, was in the top third most-targeted per route run. But out of 94 receivers with at least 25% of their team's targets, Cooper was a lowly 79th (right next to underperforming slot buddy Jason Avant). Cooper was targeted only 15% of his routes, compared to Jackson's 22% -- even though Cooper faced the single coverage shown above nearly all year. The split between Cooper's rank in target percentage and his rank in yards per target is extreme, and may make it easier to understand the type of receiver he is. For example, there are certain receivers who were targeted a lot but have low yardage production on those targets. Some are slot receivers, like Cole Beasley for Dallas and Julian Edelman for New England. The others are underperforming #1 wide receivers on bad offenses: Buffalo's Stevie Johnson, Jacksonville's Cecil Shorts, Washington's Pierre Garson, and Tampa Bay's Vincent Jackson. Cooper had the opposite problem. He was targeted few times despite solid performance on those targets. What receivers put up that same split last year? Secondary receivers who aren't particularly good, but get single coverage because the defense doesn't consider them threats: the aforementioned Stills in New Orleans, Tampa Bay's Tiquan Underwood, Dallas' rookie Terrance Williams, San Diego's Eddie Royal, Seattle's Doug Baldwin, Green Bay's James Jones, Kansas City's Donnie Avery. As far as the stats are concerned, these are Cooper's most direct comparables, and none of them (with the possible exception of Williams' upside) are players you would be excited to have as a starting wide receiver on your offense. That's the type of player Riley Cooper is: a replacement-level starter that defenses are more than happy to leave alone to gameplan against actual receiving threats like Jimmy Graham, Dez Bryant, Jordy Nelson, and DeSean Jackson -- and actual running threats like DeMarco Murray, Jamaal Charles, and LeSean McCoy. If the Eagles let Maclin walk in free agency and re-up with Cooper as their #2 wide receiver, you'll hear the champagne popping in defensive coordinator meetings across the NFC. With Foles neutering the read-option attack, Chip Kelly needs wide receivers on the outside who can stretch out the defense and give McCoy room to run. Cooper, for all his other strengths, isn't that guy. And that means you not only don't pay to keep him, but you also actively look for an upgrade. **One caveat: the offense needs at least one more receiving threat from somewhere. While wide receiver is the obvious play, it's not the only one. In his rookie season, Zach Ertz did finish sixth among tight ends on yards per pass route run. Just saying. Tagged with Philadelphia Eagles, NFL, Offense, Offseason, Free Agency, Riley Cooper, DeSean Jackson, Nick Foles, Read Option, Zone Read, LeSean McCoy, Jason Avant, Wide Receivers, Zach Ertz, Pro Football Focus, Statistics, All-22, Chip Kelly. January 13, 2014 by Brian Solomon.